DANA POINT — A pod of Eastern Tropical Pacific orcas were spotted off the Dana Point and San Clemente coast in mid-September. Dana Wharf Sportfishing (@FishDanaWharf) shared this photo with The Log via Twitter of an orca sticking its head out of the water. The pod of ETP orcas was en route to San Diego, according to staff at Dana Wharf. 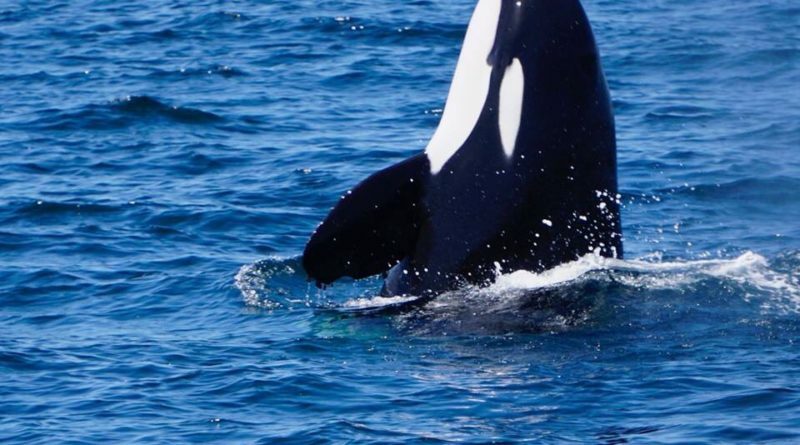 The South Orange County sportfishing charter company also Tweeted a video on Sept. 13 of the pod of orcas “attacking a dolphin.” A recent news report about the rare orca sightings off the Orange County coast stated the killer whales were in the area to hunt dolphin. Sighted three adults and one young orca just ten minutes from Catalina Avalon Harbor while we approached on the charter AM. Boat Captain cut engines and circled around while orcas swam belly to surface just feet from side and went under. They arched out of the water tummy up and young one with mother waved tail as dove deep once. It was an amazing site!